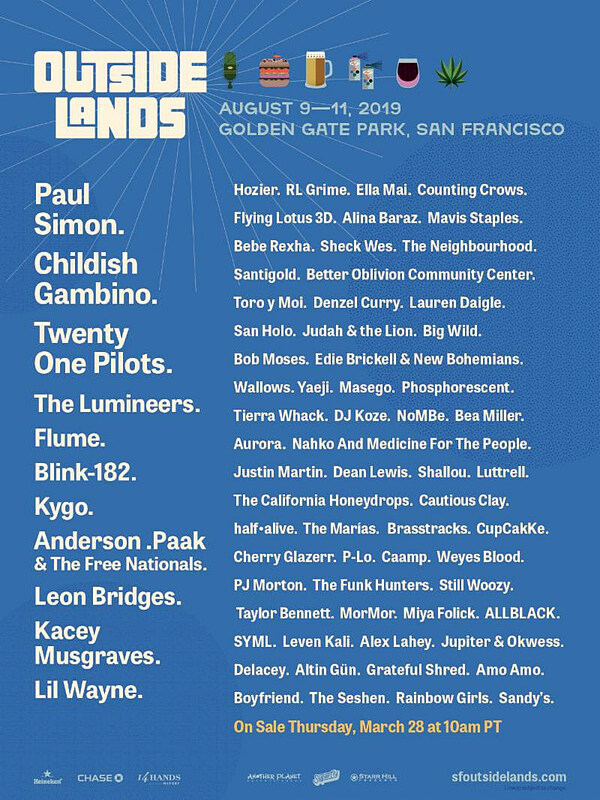 Last week, it was revealed that Paul Simon — who has retired from touring but is still doing occasional shows — would be one of the Outside Lands headliners, and now the full lineup has been announced. The other headliners are Childish Gambino and Twenty One Pilots, and the lineup also includes blink-182, Flume, Anderson .Paak, Leon Bridges, Kacey Musgraves, Lil Wayne, RL Grime, Ella Mai, Counting Crows, Flying Lotus 3D, Mavis Staples, Sheck Wes, Santigold, Better Oblivion Community Center, Toro y Moi, Denzel Curry, Edie Brickel & New Bohemians, Yaeji, Phosphorescent, Tierra Whack, DJ Koze, CupcakKe, Cherry Glazerr, Weyes Blood, MorMor, Miya Folick, ALLBLACK, Alex Lahey, and more. The fest goes down at San Francisco’s Golden Gate Park from August 9-11. Tickets go on sale Thursday (3/28) at 10 AM PT.